Finally came January 19 Epiphany religious holiday in Russia, when the ice hole in the shape of a cross dipped believers. Until that day, I never dared to enter into the icy water. I know that after this no one ever gets sick and all feel a burst of energy, but it was still scary. Simply, I am very thermophilic. But my doubts were in vain. In the company of people to enter into the icy water in the winter at a temperature of -30 degrees Celsius, it is not as scary as one. Do you realize that it is inevitable and just go along with everyone. Berd River was ready to take the strongest people in the world in its waters, and we did not make her wait. Three times the sign of the cross, I went into the water … One, two, three times – each dipping his head seemed somewhat surprising. I do not know what can be compared to those feelings. Not that understanding, I got out of the water and grabbed my outstretched someone caring, towel. Indeed, as if born anew, unforgettable experience. 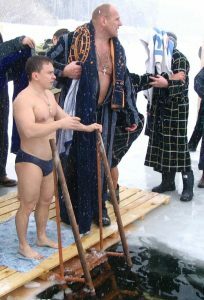 Alexander Karelin, it seems, took part in this sacred ritual every year, so easily jumped into the water and just as easily come out. His first appearance was very harsh, and I did not dare to speak to him. I thought that he must often take out the fans, and he was tired of his popularity. But when we all gathered at the same table at home Victor Golubev, I realized how appearances can be deceptive. Karelin really just talking to all without exception, joked, encouraged, was interested in someone else’s success in the sport, I asked about the material and technical equipment of the local gyms. Sauna bathing after we came at an opportune moment. Warming after a going outside, I decided to invite Karelin in the Championship of Siberia junior athletes for prizes Konstantin Pavlov, ie to your tournament. Implementation was scheduled for February 23, male holiday in Russia. He easily agreed, and said that it is necessary to come, so even with a gift for the children of school sports. 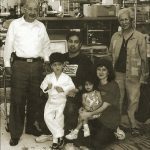 Honestly, I was happy as a child. In the evening, goodbye, all live in different cities, and I became even more closely to prepare for the competitions. 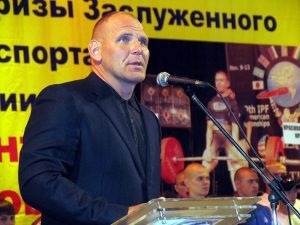 February 23 Alexander Karelin in the delegation from the city of Novosibirsk, arrived in my home town of Leninsk-Kuznetsky in the opening of our Siberian Powerlifting Championship among juniors for prizes Konstantin Pavlov. I met him at the entrance to the city. Probably, from the outside it looked very funny, like a huge mountain welcomes and hugs the little athlete. Accompanied by a police car, we have carried out to the mayor’s office, where we were already waiting for Mayor Valery Ermakov. Still, not every day in our mining town comes to three-time Olympic champion. Alexander Karelin was keenly interested in the development of sport in the city, asking the names of the most distinguished athletes. The official part was over, and we rushed to the opening of the tournament in the Palace of Culture. Yaroslavsky. This great man in every sense attracted worldwide attention, the auditorium was packed to overflowing. Everyone wanted to get an autograph, but even better – to shake the hand of a great athlete. Alexander Karelin, no one tried to deprive the attention, answered questions from journalists and our athletes. My visit to the mining town – said he told the newspaper, – due to the fact that I have great respect for the great, without exaggeration, an athlete – Konstantin Pavlov. I know what it means to be the strongest in the world and how difficult it is to hold this championship for many years. Tell you a secret, just between us, I call him “Jack” because sometimes it seems to me, there are no scales that he could not raise. With great respect for Constantine, and always I try to help in the conduct of the competition. Today brought him a gift – a new model of the post, which he had long dreamed of. Speakers said many nice words addressed to me and of course, it was very nice. At the climax of his speech, Alexander Karelin gave school sports in our city a brand new bar, and a certificate for it handed to the youngest athlete in our school Vadim Tsvetkov. On the same day in the school of struggle carried out yet another competition, and it is clear that we could not show our fighters Karelin. Happiness local athletes was no limit. After this has been to open a gym. In general, the day was saturated. Tired and hungry, we arrived at the banquet hall, where little had violated the sport mode. The delegation headed by Alexander Karelin left, and the city has long discussed the visit of three-time Olympic champion. For me holding such events is very difficult, because I had also to train and perform at the event. I am grateful to the President of «Titansupport» Company Pete Alaniz, who helped and helps me, thank Pete !!! Диета, питание и сгонка веса Мой друг Трехкратный Олимпийский чемпион Александр Карелин или как я проводил соревнования.